a1 1x12 + a2 2x22 + a3 3x32 + 2 a1 2x1x2 + 2 a1 3x1x3 + 2 a2 3x2x3 = 0 (for given real numbers ai j). Such a quadratic surface exists of straight lines through O, and hence we call it a cone with top O. In this section we will see that the intersection of the quadratic surface with the plane x3 = 1 is a parabola, a hyperbola or an ellipse. Speaking in projective terms, each straight line through O is a point, and the quadratic surface a conic (parabolas, ellipses and hyperbolas are (together with their degenerated versions) exactly the possible intersection figures of of a common right circular cone and a plane). Short notation of this matrix equation: xt A x + 2 at x + a3 3 = 0. The symmetric matrix A has two real eigenvalues λ1 and λ2 (that possibly coincide), and there is in ℜ2 an orthonormal base consisting of eigenvectors of this matrix: say r1, r2, where Ar1 = λ1r1, Ar2 = λ2r2. Use coordinates y1 and y2 with respect to this new base, so x = y1r1 + y2r2, or, in an other notation, x = Ry where r1 stands in the first column of R and r2 in the second column. Then the matrix R is orthogonal, which means Rt = R-1. Now check by calculation that RtAR is the diagonal matrix with eigenvalues λ1 and λ2 on the diagonal. short λ1y12 + λ2y22 + 2 b1y1 + 2 b2y2 + c = 0. If λ1λ2 = 0 we get the equation of a parabola. Else, if λ1λ2 is positive, we have the equation of an ellipse, and if λ1λ2 is negative the equation of a hyperbola. O79 Elaborate these calculations with x12 + 2 x1 x2 + x22 + 3 x1 + 1 = 0, and with 2 x12 + 2√2 x1 x2 + 3 x22 + x2 = 0. Now we are going to find the equation of the tangent in a point of the conic. 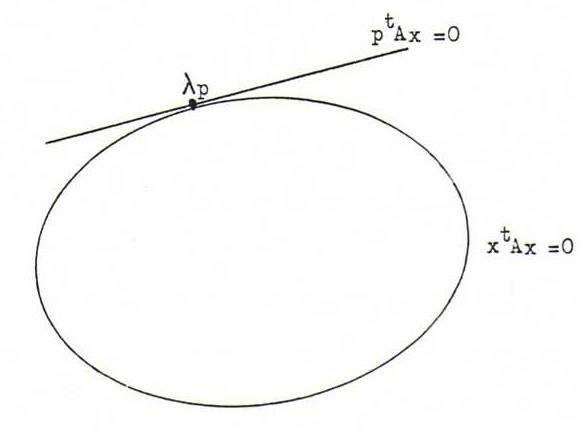 Let xtAx = 0 be the equation (in homogeneous coordinates) of a conic, and let λp be a point of the conic, so that ptAp = 0. Let λp + μq represent an arbitrary straight line through λp. Intersection with xtAx = 0 gives λ2 ptAp + λμ(ptAq + qtAp) + μ2 qtAq = 0, so also μ(2λ ptAq + μ qtAq) = 0. Now μ = 0 is a double solution of this equation (and hence λp a double intersection point of the line and the conic) if and only if ptAq = 0. If x = λp + μq, then ptAq = 0 ↔ ptAx = 0, so ptAx = 0 is the equation of the tangent in λp to the conic xtAx = 0. So we find the equation of the tangent in a point of the conic with the method of 'honest distribution'. O80 Which equation has the tangent in λ(0,-1,1) to the conic x12 + 2 x2 x3 + x22 + 3 x1 x3 + x32 = 0?